BEAVER DAM—Students are benefiting from a program at Moraine Park Technical College that allows them to take manufacturing classes while they are still in high school. 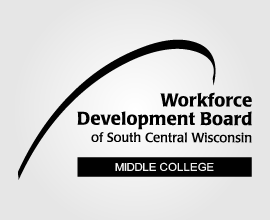 Middle College is a collaborative project between Madison Area Technical College, Moraine Park Technical College and the Workforce Developmental Board of South Central Wisconsin. Pat Schramm, executive director of the Workforce Development Board, said the program is in its fourth year at Madison College and in its second year at MPTC in Beaver Dam. The first class of 11 students from the Beaver Dam campus graduated last May. Students from Beaver Dam High School and Don Smith Learning Academy have been part of the program. There are no complete statistics on the graduates from the program, but Schramm said she is aware of three students who are studying for manufacturing careers and have companies interested in them. Schramm said Middle College was created because area companies said there was a need for students to enter into manufacturing jobs. One company related that most of its skilled workforce was going to turn over in the next six years. “There are a huge number of people retiring,” Schramm said. In addition, Schramm said there was a desire to offer something to those at risk of dropping out of high school. In many cases those students do not feel high school coursework is relevant to them. “Middle College is a hands-on learning environment,” Schramm said. Students enter the program at the beginning of the second semester of their junior year. The students have to be in good standing credit-wise, and seeking to accelerate their training while they are still in high school. The students continue in the WorkSmart Program after they graduate from high school. In addition, the students are paid interns at local manufacturers during the summer months between their junior and senior year, and in the summer after graduating from high school. “If they don’t get picked up by an employer, we help them enroll in MPTC or some other school, and help them with financial aid and continuing support,” Schramm said. Students at the Beaver Dam campus are working toward jobs in the manufacturing field. There are 10 students in the program this year from Beaver Dam, Dodgeland and Mayville high schools. Organizers also hope to add more schools from Dodge County. Some of the Madison College campuses offer a health care track as well. Schramm said students from area schools can take those classes, but they have to work out a way to get to the program and continue to do well in their high school classes as well. Beaver Dam campus coordinator Karen Coley said they are looking at bringing the health care program to the Beaver Dam campus at some point. Schramm said there will be a culinary arts program starting in Madison in January. “If that is successful we will move that to more locations in the region,” Schramm said. Students who are currently first semester juniors can talk to their guidance counselors about the program. “We are starting to recruit now for the January group,” Coley said. Additional information about the program, including eligibility requirements, can be found at http://wdbscw.org/worker-pipeline-development/.